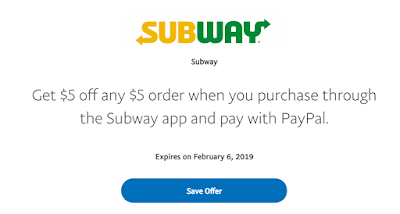 Savvy Spending: Subway: Possible $5 off $5 order with PayPal! Subway: Possible $5 off $5 order with PayPal! You may be able to save $5 off a $5 Subway order! Just go here and see if you can save this offer to your wallet! Then you'll get $5 off ANY $5+ Subway order when you purchase through the Subway app or Subway.com and pay with PayPal! Note that this single-use offer expires on February 6th and is open only to the first 300,000 to save the offer. If eligible, you will also be able to locate this offer in your PayPal wallet section.